Typescript (photocopy) of the original manuscript. Photocopied columns from Newmarket Era and Express from 1951-1952 written by Ethel Willson Trewhella. Red Cross Society of Newmarket was endeavoring to raise sufficient funds to purchase an ambulance to send to the front with the second contingent during World War I. This Cook Book was sold to raise the desired sum. A History of St. Paul's Anglican Church in Newmarket from it's earliest planning in the 1820s until 1976, written by a church member. Newmarket Centennial, 1880-1980: Souvenir Programme and Guide. 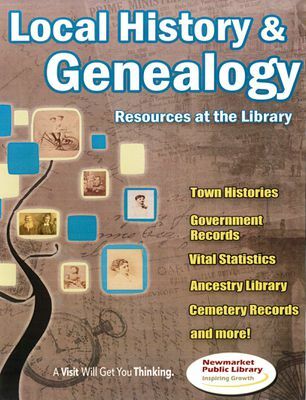 A digital selection of items from the Local History and Genealogy Collection of the Newmarket Public Library. Adding material is an ongoing project.